This is new a project template for vue-cli. The development setup is utilising Vue 2 Webpack Hot Module Replacement with Vue loader, Hapi Nodemon running with Gulp and BrowserSync. It includes CSS extraction (build only), linting (ESlint) and unit testing (Karma, Mocha, Chai, Sinon). If you decide to run api (Hapi) unit tests using Mocha, remember about proper NODE_ENV (test), which with Lab is being set automatically. 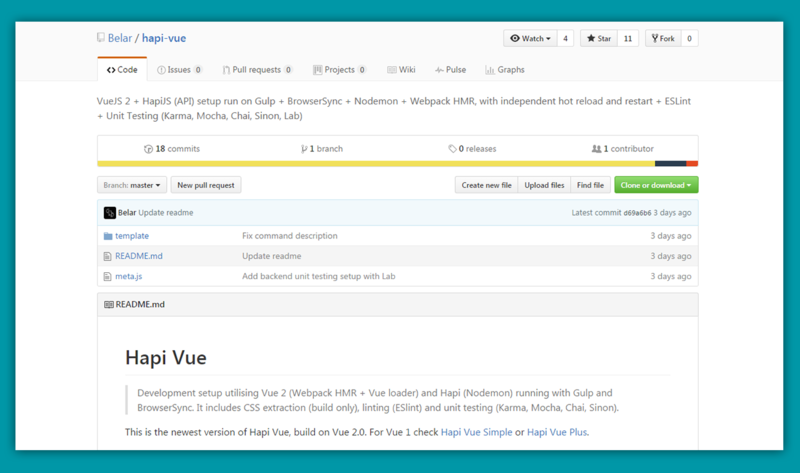 This is the newest version of Hapi Vue, build on Vue 2.0. For Vue 1 check Hapi Vue Simple or Hapi Vue Plus.